Affably modest and utterly joyous, The Band’s Visit is the perfect ninety-minute musical – and the best new musical I’ve seen since 2012’s Dogfight, which was also a small-scale off-Broadway show. Dogfight played its limited run at Second Stage; The Band’s Visit will be at the Atlantic Theater Company in Chelsea only until the end of the first week in January. (It’s been extended twice.) The source material is a film from 2007, written and directed by Eran Kolirin, a sweet morsel from Israel that attracted little notice; no one I’ve mentioned the musical to had heard of the film, let alone seen it. In it, a police band from Alexandria with a date to perform at the Arab Cultural Center in a tiny Israeli city finds itself stranded in another Israeli city, Bet Hatikva, with almost the same name. (They’re one consonant apart.) Dina, the café owner who informs them that they’re in the wrong place – and that no buses are expected until the next morning – feeds them and offers to put some a couple of them up at home and more at her restaurant, volunteering her unemployed pal Itzik to take in the remaining two musicians. The movie begins by assuring us that we couldn’t have heard about this informal cultural exchange because nothing very important happened (and the musical ends with Dina repeating this line). Then it belies that claim. Generally unassuming and embarrassed at the fuss they’re inadvertently causing, the Egyptians nonetheless have a powerful impact on the Israelis who are reaching out to include them socially and make them comfortable for the evening. Their presence encourages confidences and self-reflection. The movie doesn’t address the traditional tensions between Arab and Israeli cultures, but since it’s about the commonality of human experience, that boundary is repeatedly being crossed. Dina’s forthrightness about her own blighted romantic history – and her undisguised curiosity – permit the band’s director and conductor, Tewfiq, to transcend his usual reticence and allude to the losses of the son he feels he didn’t try hard enough to understand and subsequently of his shattered wife. His opening up to her ends up dissolving the unease between him and the rebellious trumpeter Haled by making it clear to Tewfiq that his impatience at Haled is really replaying his old anger at his son. (The script never makes that point explicitly; it hardly needs to.) The unexpected appearance of a pair of strangers in Itzik’s home on his wife Iris’ birthday not only spotlights their marital unhappiness but provokes her to act out in a way that somehow moves their relationship forward, bringing it to at least a temporary restoration of intimacy and harmony. And when Haled, emotionally the least restrained of the musicians, invites himself out on the town with some locals, at a roller disco he proffers his sexual expertise as a guide for the virginal Papi, who is so terrified of making contact with a woman that when he gets close to one the sound of the ocean in his ears drowns out everything else. In the movie’s most charming interlude, Haled surreptitiously models for Papi the first physical advances toward Anna, a young woman he’s interested in but unnerved by; initially his resistance to her efforts to get him out on the floor is so extreme that she ends up flat on her back (and in tears). The book of the musical, by Itamar Moses, is so faithful to Kolirin’s screenplay that much of the time he mostly transcribes it – a wise decision, as it turns out, since the movie is ideal for musicalizing as it stands. 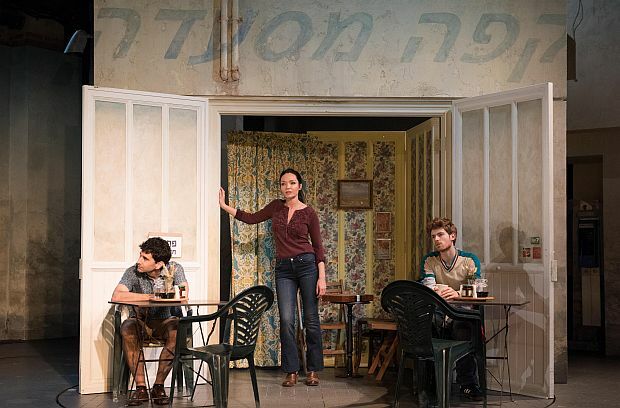 He’s added only a couple of accents: Dina (Katrina Lenk, a strong and impassioned singer who gets the lion’s share of the songs) is given a married ex-lover (Jonathan Raviv), and Haled (Ari’el Stachel) – whose favorite pick-up technique with women is to ask them if they’re familiar with Chet Baker and to croon the first few bars of his famous rendition of Rodgers and Hart’s “My Funny Valentine” – has been given a speech in which he explains that when he returns to Alexandria his parents will arrange a marriage for him that has to put an end to his amorous ways. David Yazbek, the gifted songwriter of The Full Monty, Dirty Rotten Scoundrels and Women on the Verge of a Nervous Breakdown, has provided a score with a pared-down folk style that emphasizes simplicity in the lyrics and melody and brio in the music, and Moses’ book leads unerringly and without fuss to the baker’s dozen numbers (including one reprise and a pair of instrumentals by the Alexandrian band). Except for the first of them, “Waiting,” sung by the residents of Bet Hatikva, and the finale, “Answer Me,” performed by the entire company, the songs are solos and duets, with one trio and one quartet, so that musically the arc of the show is from a group portrait of restlessness and ennui without name or explanation to a resolution that acknowledges the need for everyone on the stage – both the Israelis and these strangers who wind up being reflections of themselves – to find love. “Answer Me” – of all of Yazbek’s songs the one most reminiscent of the gorgeous ballads he supplied for Women on the Verge – begins with the plea of Telephone Guy (Erik Liberman), a Bet Hatikvan who has been waiting every evening for his absent girl friend to call him on the pay phone outside Dina’s café, and builds to a symphony of voices, all of them echoing that plea for an answer, a connection. In both the first and last numbers, the director, David Cromer, uses the revolve at the center of Scott Pask’s lovely, quietly evocative set to cross-hatch the experiences of the members of the ensemble and bring them into a soulful collective recognition of their shared humanity. You can see exactly why Cromer, who directed a famously triumphantly revival of Our Town, was drawn to this material, and he stages it superbly. Patrick McCollum’s choreography picks up Cromer’s sensibility, and without exception the entire company is in sync with Cromer and with the writers. The only actors I recognized were the incomparable Tony Shalhoub as Tewfiq and John Cariani (from Law and Order), in a performance of tremendous sweetness and longing, as Itzik. (His finest moment is a lullaby to his baby near the end of the short evening.) I love Shalhoub’s work, certainly in film but especially on stage, and aside from his depiction of the heartbroken father in Golden Boy, nothing I’ve seen him do excels his performance here. Besides the abovementioned Lenk, whose performance is a revelation, I’d also single out Stachel, Liberman, Kristen Sieh as Iris, Alok Tewari as Simon (the second clarinetist with a fervent wish to conduct), George Abud as Camal, the violinist, and Daniel David Stewart as Papi, whose comic number, “Papi Hears the Ocean,” is a high point. The six actors who play the musicians under Tewfiq’s command (the others are Harvey Valdes, Sam Sadigursky and David Garo Yellin) handle their instruments superbly, and after the curtain call the offstage percussionist, Philip Stuart Meyer, joins them onstage for an inspiriting encore. (Andrea Grody is the marvelous musical director.) You practically dance out of the theatre. On the way home I drove for a while in silence, replaying the show in my head, not wanting to let go of it quite yet.